Ever wonder what the most time consuming part of installing a solar thermal system is? Hands down it is the solar piping! Regular copper pipe requires high level of plumbing skills to carefully solder and run your copper. Once soldered the entire system needs to be flushed to remove the poisonous flux acid and then the system needs to be pressure tested. This is the easy part! Next the entire pipe system needs to be properly insulated. Not with cheap polyurethane foam but high temp EPDM foam. After this you then need to seal the insulation with either special tapes or tubing such that rain and sun won't damage the foam. Think your done? .... Wait you still need to run the sensor lines to and from the collector. Aurora Stainless Steel Solar Piping Line Sets are the only way to go. With a life expectancy of over 120 years, quick install, no leaking joints; there is simply NO comparison to copper. The 3/4" stainless steel solar piping comes with high temp 3/4" EPDM foam and a weather proof membrane jacket. 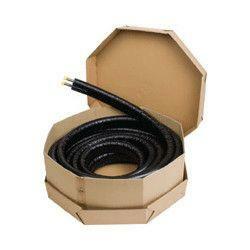 Also included on the solar line sets is a sensor wire all in one solar pipe. SAVE TIME and MONEY. Plug N' Save! Solar Heating Solutions Made Simple! Run the wire / temperature sensor and secure it to the insulation. Remember all this pipe and insulation is likely behind dry wall, under floor boards etc, very time consuming! Cover the outside of the Insulation with UV resistant coating or tape to stop the sun ruining the insulation or the birds pecking at it! Unwrap these solar pipe and run it from the mechanical room to the roof. 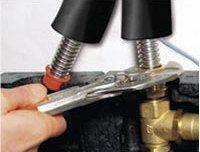 Tighten with wrench for a guaranteed leak free seal! High quality synthetic elastomer (EPDM based) with a complete closed-cell structure.